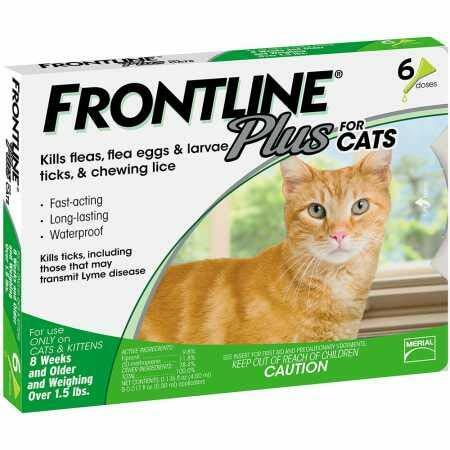 Frontline plus 6 month cat keep your cats' claws on the scratching post and off their delicate skin with frontline plus. It stops fleas, ticks and chewing lice in their tracks. It paralyzes the nervous system of these pests, effectively killing them and prevents the development of flea eggs and larvae completely stopping the flea life cycle. One easy, monthly application will keep your cats purring. Consult your vet before using. We only sell product packaged and labeled for sale in the USA. Features: · Effectively kills fleas, flea eggs, ticks and chewing lice · reduces the risk of parasite-transmitted infectious disease · fast and easy dermal application · only one application a month necessary · safe for cats 8 wks. or older · approved for breeding, pregnant and lactating queens · waterproof · 6 month supply item specifications: Size: 6 month supply active ingredients: Fipronil 9.8% s-methoprene 8.8%w.